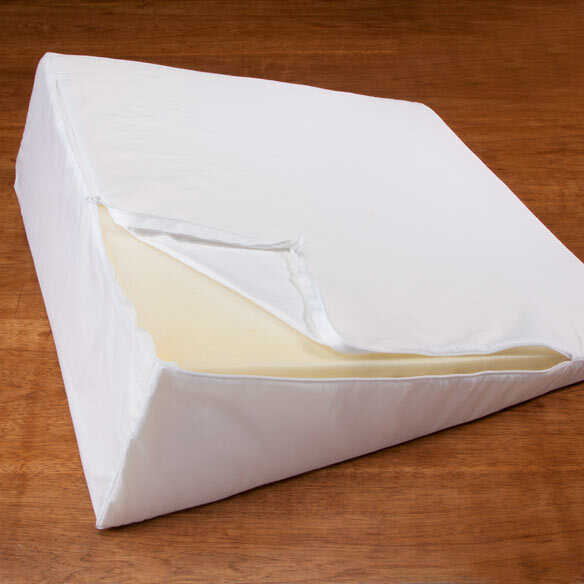 Wedge Support Pillow Extra Cover by LivingSURE™ is designed to fit our comfort wedge support. 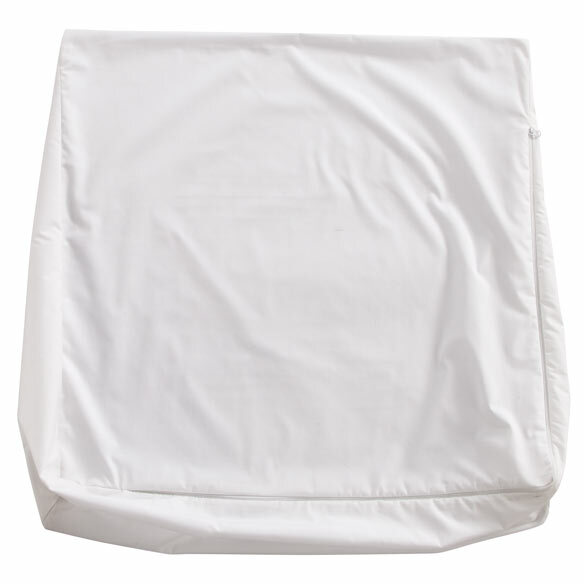 This replacement wedge pillow cover is 100% polyester. Imported. Love it. It fit my wedge perfectly. For watching TV in bed.when my acid reflux is bothering me. Helps Mother get a good night sleep. She doesn't cough at all. My husband has a breathing problem and needs to sleep with his head elevated. The wedge works for him. Works just fine. Have been hunting one of these for a long time. Thanks. Sent it as a gift; thought it was the actual pillow, not the pillowcase. From the description and the reviews it was very misleading. Also it took forever to get there. I got the wedge pillow from you also. I spent alot of money for something I can't use because it has no give.It's like laying on a board.The cover is way to tight and very hard to get on.Not pleased at all with either product. Need a new pillowcase for my wedge pillow. needed it for the house. I needed the small one and it was an excellent price. Just what I needed it for a spare cover for my wedge pillow. needed this for my pillow! I already have a wedge pillow and would like an extra cover. Need to replace an old one. My wedges needed new covers. I have a wedge and I was looking for a refill cover. Because I am having trouble sleeping flat on a pillow. I am having Surgery on my Spine, this will help me when I come home. I need this to sleep better. I own two wedge pillows and I need extra covers. A must have if you own a wedge pillow! mine is very old and falling apart, but the pillow itself is fine. I needed one for the wedge now being used. It is good to have an extra when the cover is soiled! I have a foam pillow that needs a replacement cover. We have one of these pillows and need a new pillow case for it. Like to have extra replacement cover when one is being laundered. BEST ANSWER: Thank you for your question. This pillow is offered in three different sizes. All wedges are 22 1/2" long x 22 1/2" wide. The small wedge is 7 1/2" high, the medium wedge is 9" high and the large wedge is 12" high. We hope this information will be of help to you. Is the pillow bed bug proof? BEST ANSWER: Thank you for your question. It is made of 100% polyester. It is not treated for bugs. We hope this information will be of help to you. It seems to be. We've had no problems with it as yet. I wear36Bshould I order m. or L? BEST ANSWER: Thank you for your question. Size large will work best for you. We hope this information will be of help to you. I need 18x25x8 - what size do i get? What are the dimensions of the small pillow? What are the dimensions of the different sizes of replacement wedge cover? BEST ANSWER: Thank you for your question. All the wedges and their cases are 22 1/2" long x 22 1/2" wide. The small wedge is 7 1/2" high, the medium wedge is 9" high and the large wedge is 12" high. We hope this information will be of help to you. BEST ANSWER: Thank you for your question. This pillow/pillowcase is offered in three different sizes. All wedges are 22 1/2" long x 22 1/2" wide. The small wedge is 7 1/2" high, the medium wedge is 9" high and the large wedge is 12" high. We hope this information will be of help to you.